Today I got the opportunity to open a Movado Museum lady´s quartz watch ("Movado" is Esperanto for "movement"...just fyi). The iconic, minimalistic design with its classy glossy black dial has been developed in 1947 and not changed significantly since then. Besides the simple Dauphine style hour and minute hands, it only features a golden dot at twelve o´clock position symbolizing the sun at high noon. 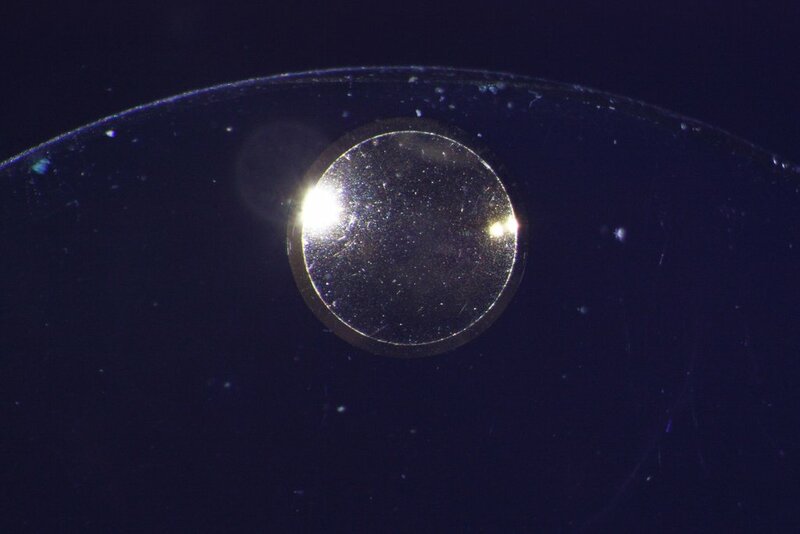 Seen under the microscope, it shows that the dot is actually concave. 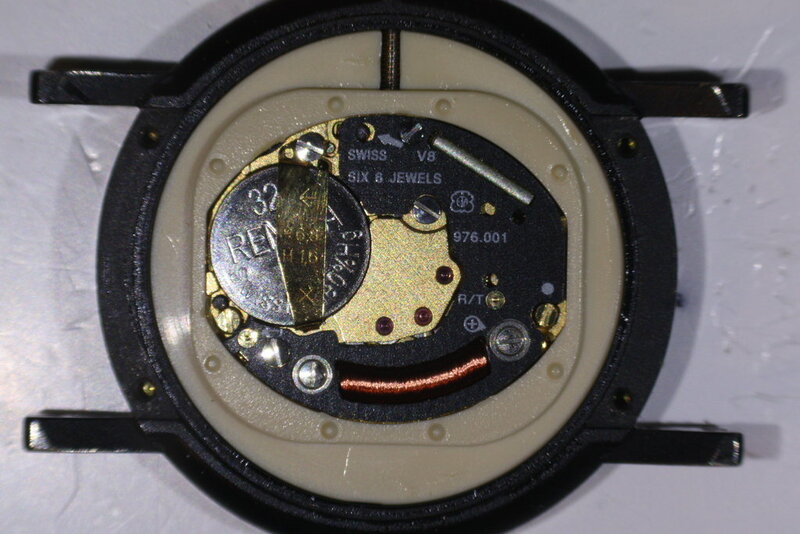 Inside is a nice, although not really special ETA-based and Movado-branded quartz movement. 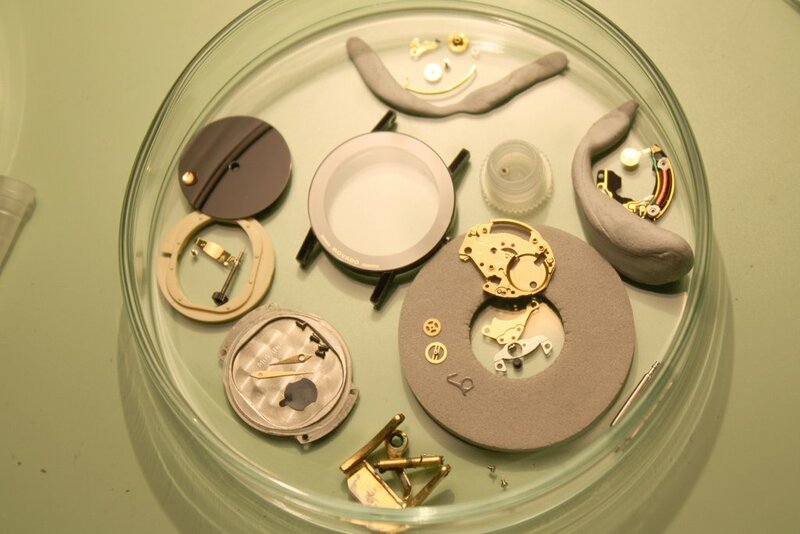 The ETA 976.001 is a reliable high(er)-end quartz movement featuring six jewel bearings (most "standard" quartz watches feature Miyota movements with zero jewels...). 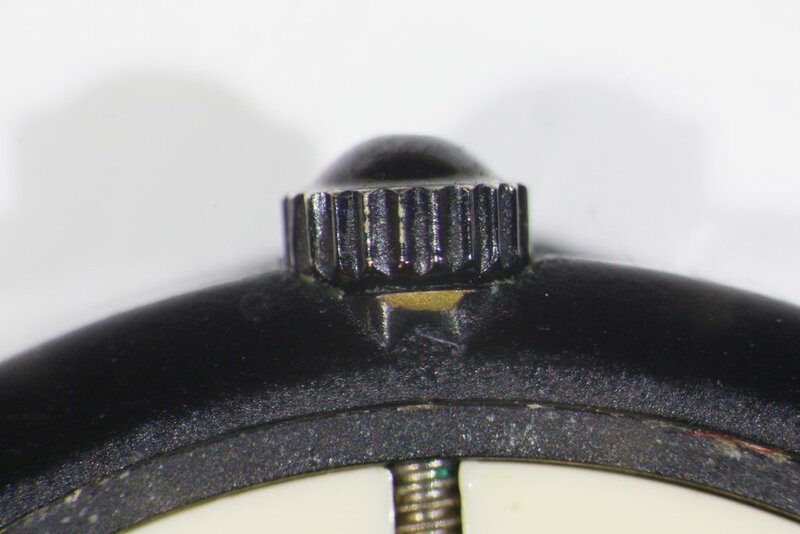 A quite unexpected finding for a watch as expensive as this, is the case damage near the crown - is this just coated brass? 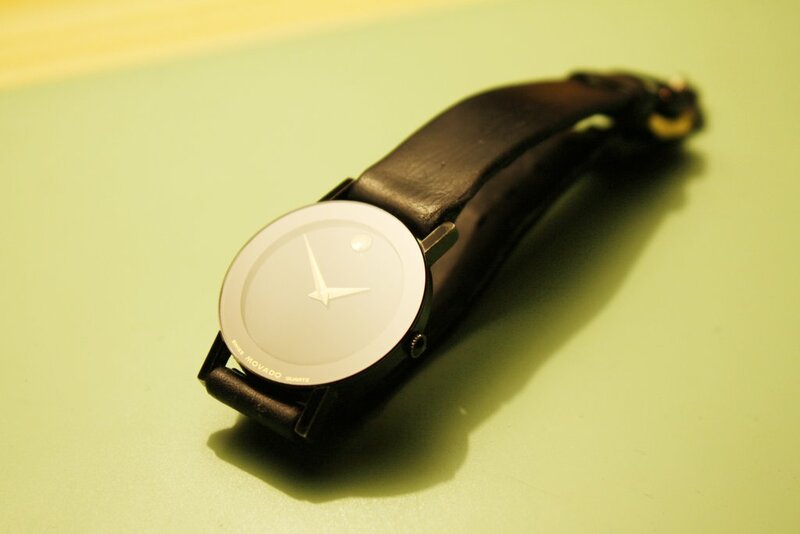 Case quality should be much better imo...seems almost like a replica watch (not yet sure of that, though). 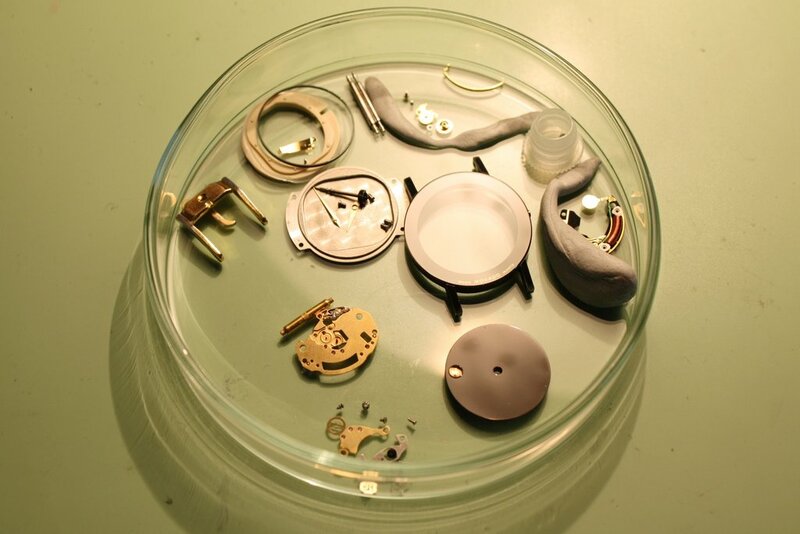 Today I disassembled and cleaned the complete watch. A photo before the cleaning procedure can be seen below. Note the green corrosion on the watch strap buckle. 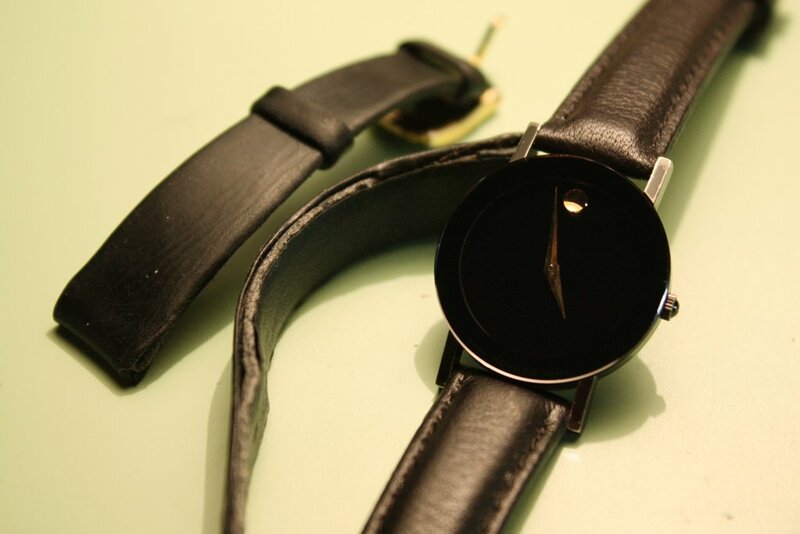 The quality is really not that outstanding as the Movado brand might suggest. The watch is no replica watch, however. 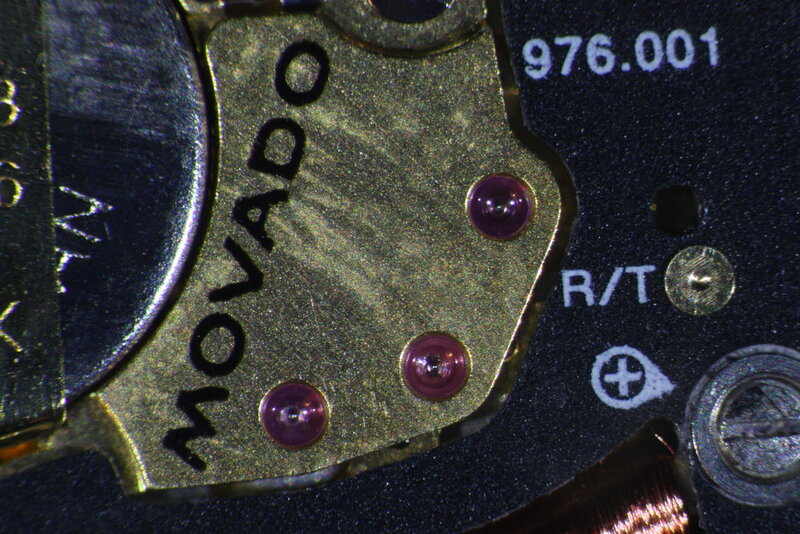 According to this info page, Movado used ETA-produced movements (labelled with MOVADO) and until the year 2000 the dial logo read "SWISS MOVADO QUARTZ" (today it is "SWISS MOVADO MADE"). 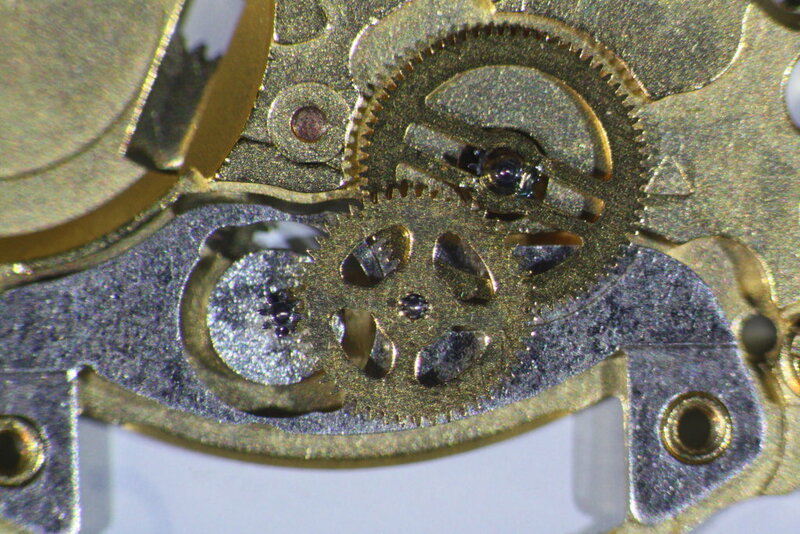 The next photo shows the movement after cleaning. Sadly, the "MOVADO" imprint on the wheel train bridge did not survive the ultrasonic stage of the cleaning. My mistake - I did not expect it to be superficially printed-on only and noticed my error too late. 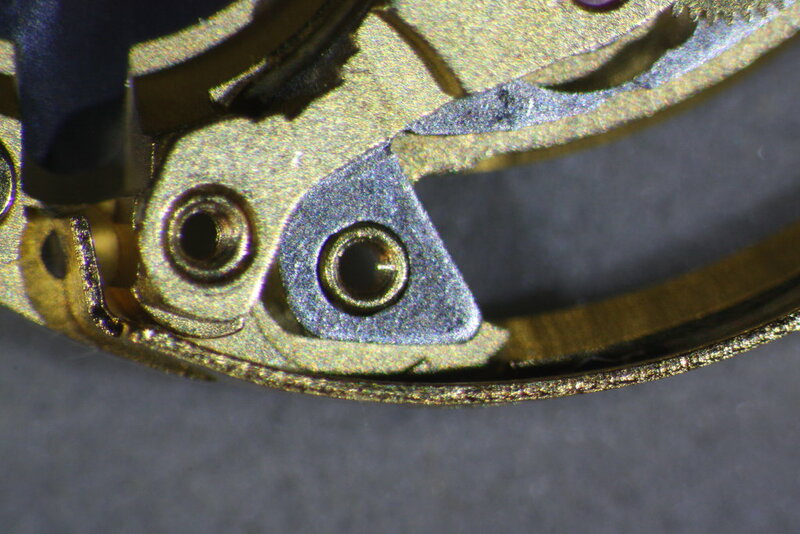 High-quality manufacturers usually use at least laser engraving for branding a watch movement they did not build from scratch. The simple wheel train. Without a second hand, there is no need to hurry (or consume too much energy...) - the silver stepper motor on the left thus only turns once every 20 seconds (three steps per minute...) and rests in silence for the remaining time. Seems to fit for this minimalistic design. A nice feature is the coil protection which shields the drive coil from the side (the coil was still missing here, of course). Finally the completed movement. 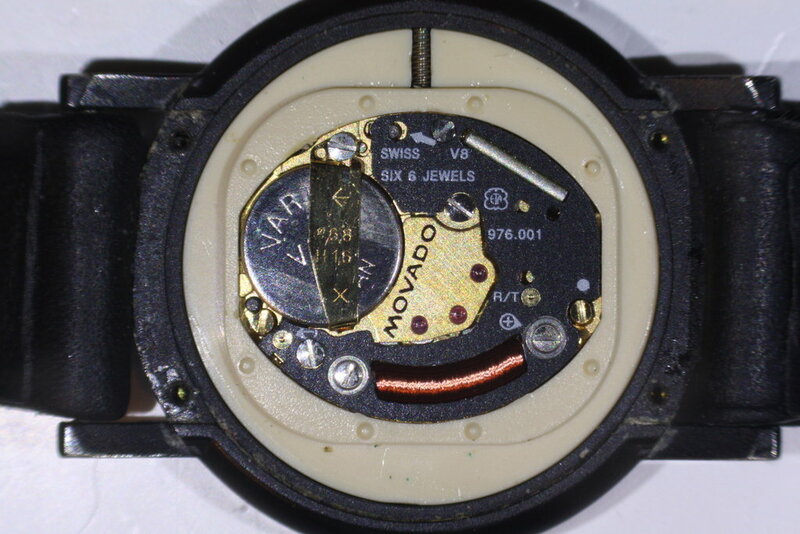 As noted earlier in the article the "MOVADO" label did not survive cleaning. I assume it would have been preferable to laser-etch or engrave the letters on the wheel bridge (admittedly this would have been more expensive...). After a week of some (minor) testing the watch worked without any problems. Here the completed watch with a new and hopefully more stable leather strap (the old one which lies next to it here had started to - well - disintegrate...).